Mix flour, salt and yeast in a mixing bowl. Warm milk and sugar slightly and stir until the sugar dissolves. Add the egg yolks to the milk and once combined add the mixture to the flour mixture and mix until it forms a smooth dough (approximately for 10 minutes). Slowly add the butter in 2 portions. Cover the dough with a wet cloth and place in a warm place. Once the dough has doubled in size make 80g balls and set aside with a wet cloth on top to ensure the dough doesn’t dry. Roll out the dough into thin sheets and cut it into 1 inch thickness and 15cm length. 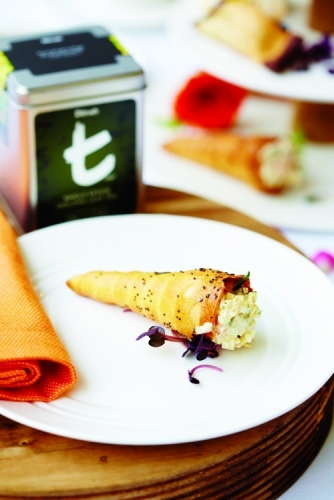 Roll the dough on the canola cone and brush with oil. Apply egg wash to the cone and dust with poppy seeds. Bake at 180C for 10 min. Combine all the poaching stock ingredients in a pot and bring to a simmer. Add the prawns into the pot and cook for 6-8 minutes. Once boiled immerse them in cold water. Peel, dry and dice the cooked prawns. Chop the cocktail onions, tarragon and combine in a bowl with celeriac, apple julienne, salt, pepper and lemon juice. Fold in the crème fraiche.